1. Tulips with especially large blossoms. 2. Tulips too tall to be supported by the vase. 3. Lack of stem support within the vase. 4. Tulips past their prime – as the tulips get older, they start to break down and the stems become weak. So, here’s the HuffyHow solution to floppy tulip syndrome. 1. When buying tulips, look for bunches with small compact blossoms, fresh-looking green stems, and tightly closed buds. Avoid tulips that show any fraying on the blossom edges – these are likely on their way out. It’s more about the quality and freshness of the bouquet than where you buy them. Some of my best performing tulips have been the $5-6 bunches from the grocery store. 2. Carry the tulips home carefully and get them into water as soon as possible. Don’t leave them in the car while you run 20 more errands, especially on a warm day. 3. Find a vase with a broad bottom and tall enough to give some support to the tulips. I’ve got a rectangular one that works great. 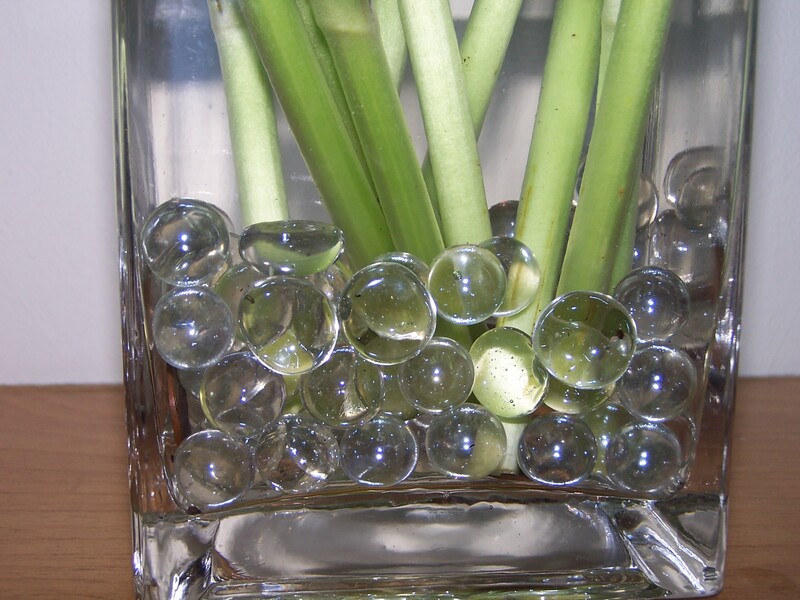 Fill your vase with about 1.5 to 2 inches of glass marbles (sold in flower shops and in the flower departments of craft and grocery stores.) I add a few old pennies, as I’ve heard that the copper aids stem strength, although I have no clue as to the validity of this thesis. I guess pennies are optional, or maybe I need to do another study. 4. Use sharp scissors to trim your tulip stems at least 1.5 to 2 inches, depending on the height of your vase, and more if your vase is very short. 5. 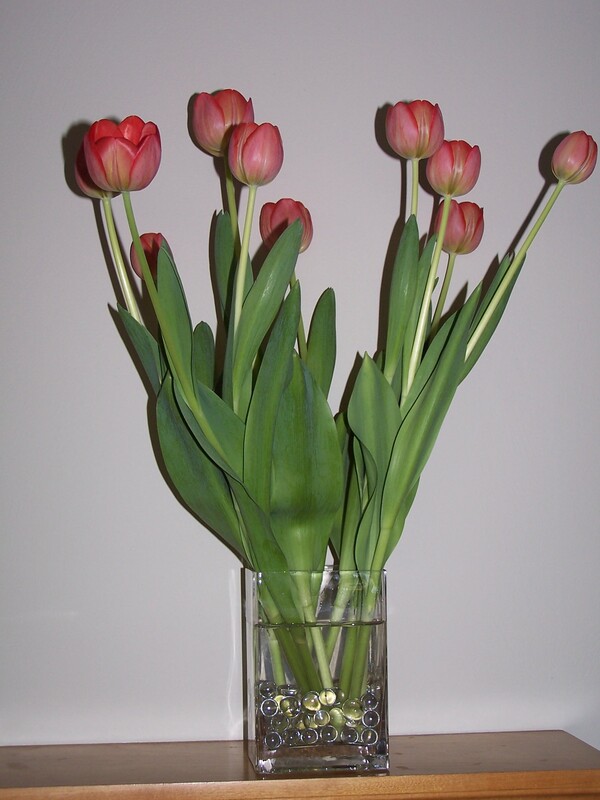 Arrange the tulips in the vase placing them in one at a time, carefully inserting the stems into the marbles. Don’t just slam the whole bouquet into the vase – make sure each stem is supported by the marbles. 6. Enjoy your lovely tulip bouquet. As the bouquet ages, the tulips will start to flop over a bit, but you should have at least 4-6 days of a beautiful, upright bouquet. 7. An extra tip for men: Use these steps to surprise your sweetie and have a great-looking tulip bouquet waiting in a vase when she gets home. She’ll be impressed and think you spent a lot of money at the florist. Nothing bad can come from surprising your partner with flowers. Success! Floppy tulip syndrome solved at last! A beautiful upright tulip bouquet. This entry was posted in HuffyHow and tagged blossoms, floppy tulips, stems, tulips by Huffygirl. Bookmark the permalink. Have you considered putting a Viagra tablet in the water? Seriously, I have the same problem with tulips and have come to the conclusion that they are not meant to be picked. I think it best to leave them in the garden and allow the rabbits to munch them. This HuffyHow REALLY works. No need to stop enjoying tulips. However, I do think the greenhouse variety will always perform better than ones picked from the yard. The yard-grown tulips have other issues – how they were fertilized, how much exposure to weather and low temps, etc. Thanks Judy. I’m not sure what you mean by floppy petal syndrome though. I’m not an expert on growing tulips that stand tall. What I see others doing that seems to work is: planting the tulips in clumps or groups so they help support each other, plant tulips that emerge later in spring, which are more likely to be sturdy and good looking because of less exposure to cold weather, and only choose the shorter varieties, which are more likely to stand upright. I think it also helps to fertilize with bulb food when the tulips are actively growing, so they’ll have better stem strenght for the next season. Thank you. This actually works and I’m delighted to find your solution! I’m glad it worked! Thanks for stopping by. Well I hope all your tulip bouquets turn out lovely. I took a peek at your blog – I’ll be posting some pictures of Ireland in an upcoming post that I hope you enjoy! Thanks huffygirl (! ), and I look forward to your photos of Ireland. When were you there? And what parts of Ireland did you visit? We flew into Shannon, did the Ring of Kerry, drove along the southern coast, then up to New Ross and ended in Dublin. We were there in 2005 but just recently got the pictures out to work on again. Should be coming up on my blog the end of next week or beginnning of the following week. I hope you enjoy it. I look forward to seeing your photos of Ireland. I sure would love to get back for a long visit with friends there and a drive around the country. We found the driving a bit nerve-wracking, especially when we had to make left turns! Guess that defeats the purpose of renting the car. We found the Irish take a much more cavelier attitude towards driving than we do – we’d see cars pulled up to the gas pump, engine running, 2 wheels on the curb and 2 on the road, ready to take off at a moment’s notice. One day our friend drove and clipped the driver side mirror. It was hard to get used to shifting with the left hand, and of course none of us had driven a manual shift car for 20 years. It does get easier with practice. I was lucky that I sold Tupperware for awhile and did well enough that I was given a company car until I just could not do one more sales party! I probably had the car for a year or two so I got used to driving there. I believe it was manual shift. Most of the cars were at that time there. I always felt it was tough for visitors to drive there because the person driving would have to concentrate so much on the different driving they wouldn’t be able to enjoy the view as well. Well I hope you remember which side to drive on the next time you visit! He he he! I would love to get back for a visit. It has been way too long. However, the finances are not available for a trip there. Please God one of these days.